BB members joined with some two thousand people gathered on Scapa beach to watch a team of volunteers create a picture of Lieutenant Robert William Taylor from the Isle of Flotta, Orkney, as part of Danny Boyle’s “Pages of the Sea” project. In addition, several boys & leaders joined members of the public in creating silhouettes of soldiers in the sand, remembering the millions of lives lost or changed forever by the conflict. Members of the Company decorated pebbles with poppies and other images along with the name of each man who lost his life from the local area as part of their activities in the lead up to Remembrance Day 2018. The boys and girls also worked on their sewing skills to make some poppies that were part of a community project at Southport W H Smiths featuring a display of over 4000 poppies. The Company also collected £1000 for the Royal British Legion. There But Not There silhouettes were used during our Annual Remembrance Sunday Service at South St. Nicholas Church, Kincorth. The silhouettes represented men who feature on our local war memorial that gave the ultimate sacrifice. The boys had researched the names on the War Memorial and approached the local City council to arrange cleaning and repairs to the memorial in time for the 100th Anniversary and the boys were proud to lay a wreath there following their morning Church Service. In July, young people and Leaders from 1st Ackworth, 1st Acomb and 1st Ossett Companies visited Ypres, Belgium as part of their Summer Camp. They visited Essex Farm Cemetery, Tyne Cot Cemetery and the Menin Gate. At Essex Farm Cemetery over 1000 servicemen of the First World War are buried or commemorated, some named, but many unknown. It was here that John McCrae, a Canadian surgeon working at the Advanced Dressing Station (hospital), wrote his famous poem ‘In Flanders Fields’. The group visited the grave of Private Hugh N Broadbent of the West Yorkshire Regiment, who was educated at Manor School, York where many 1st Acomb members currently study. Tyne Cot Cemetery is the biggest Commonwealth War cemetery in the world and is located in an area that had seen intense fighting during the First World War. The cemetery has a wall surrounding it, which is to remember the fallen whose bodies were not found or could not be identified. During the visit each boy was given a name similar to their own name and laid a wooden poppy cross on it, a very memorable experience for all involved. The Menin Gate in Ypres, Belgium is a memorial to the missing commonwealth soldiers of the First World War. Rows upon rows of slabs bear thousands of names chiseled into the stone. It is startling to realise that each of the 54,000 names belonged to a fallen hero. The group attended the Last Post ceremony, which is held every evening at 8pm under the great arch of the Gate and were lucky to arrive in time to stand on the front row. 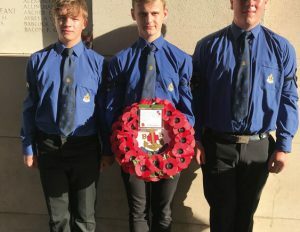 The oldest Senior from each of the three Companies, Oliver Scogings, Taylor Philpott and James Senior paraded across the arch and laid a wreath in memory of all BB members who lost their lives.